The 2001 romantic comedy will fatefully hit Blu-ray early next year. 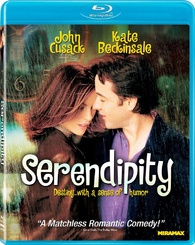 In an early announcement to retailers, Lionsgate is preparing 'Serendipity' for Blu-ray on January 3. The Miramax film stars Golden Globe® nominee John Cusack (Best Performance by an Actor in a Motion Picture - Comedy/Musical, 'High Fidelity,' 2001) and Kate Beckinsale ('Pearl Harbor') as two star-crossed lovers who are hoping to find their way back to one another years after the night that they met. Featuring a hilarious supporting cast including Molly Shannon (TV's "Saturday Night Live"), Jeremy Piven (HBO's "Entourage"), Bridget Moynahan (TV's "Blue Bloods"), John Corbett (TV's "Parenthood") and Eugene Levy (the 'American Pie' series), the Blu-ray Disc includes bonus materials with director Peter Chelsom ('Shall We Dance') - film commentary, a production diary and deleted scenes with Chelsom's commentary - along with storyboard comparisons and a behind-the-scenes featurette. Jonathan (Cusack) and Sara (Beckinsale) meet one evening while shopping for the holidays in New York. While they're each on a task to purchase a gift for their respective significant others, the two have instant chemistry. Despite both of them wanting to pursue a relationship, Sara decides that their love should be left up to fate - and if they are meant to be, then they will find one another again. Years later, and engaged to other people, Jonathan and Sara both find themselves wondering what could have been. You can find the latest specs for 'Serendipity' linked from our Blu-ray Release Schedule, where it's indexed under January 3.